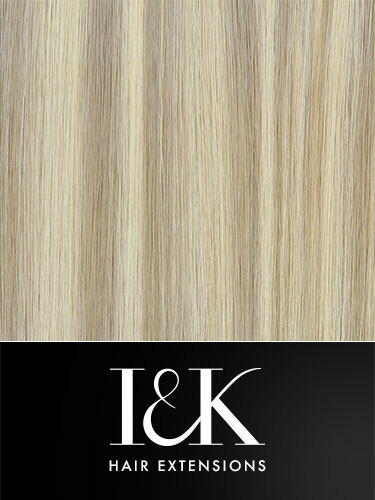 The fringe is thick and straight, teaming up with long wispy side layers that seamlessly blend with your own hair. I love the thickness of the fringe, I bought it so I could cut and style it into bettie bangs. I have never bought extensions or bangs before as my natural hair very thick and is 32" long when straight. I wanted human hair fringe so I had the versility to switch between bangs or doing my quiff, plus I'm very low maintenance when it comes to my hair the only thing I do is colour and don't ever use heat. And I cut and later my own hair. Plus I breakout easily and didn't want to have a permanent fringe causing breakouts, I have had a fringe before and hated it, but with this it's so easy an fuss free. Before I placed my order I asked what's best fringe to achieve this style, and in no less then an hour they got back and showed me a blog that achieves the look. The colour matches my Blue black hair perfectly and it matches my hair texture too, and am able to blend it perfectly with my natural hair. I bought a polystyrene head and went ahead and cut and styled it. I suggest if your unsure what to buy message them as they will help, and go to your local hairdressers to help you with it, I plan on buying a couple more for other styles I have in mind. Giving this 3 out of 5 stars because the fringe looked puffy and fake, even after styling. However, when I swept it to the side as a swooping side fringe, it looked really great and it's transformed my whole look. Would be great if you could sell swooping side fringes! 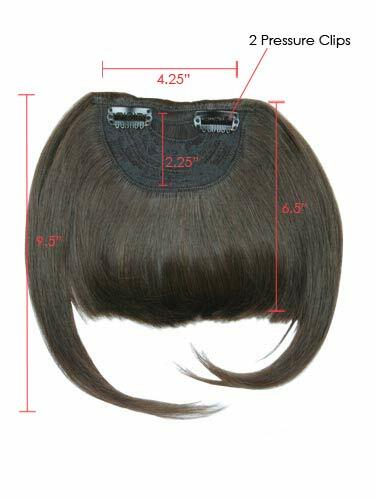 This product really caught my eye so I decided to order a bold blunt fringe. I have dark red hair so I purchased the copper red colour. The chart is really small and you can barley see the colours so when it arrived it was way lighter than I expected. I plan to dye it next time I dye my own hair. I asked about dying the product and they said it would be ok. The delivery was really fast and affordable. The customer services answered my question quickly and explained all I needed to know. Would recommend. I ordered this fringe in 1B a couple of days ago and I received it this morning. It is absolutely amazing and looks exactly as it does on the model in the photo. I have had it in all day and the amount of compliments that I have received is incredible. My own boyfriend couldn't believe that this was a clip in and said he loved my new haircut when he got in from work. I love it so much that I have put in another order for the side swept fringe today. Beautiful new hair in minutes, Fabulous, Thank you so much HairTrade.